I took this picture at lunchtime yesterday. 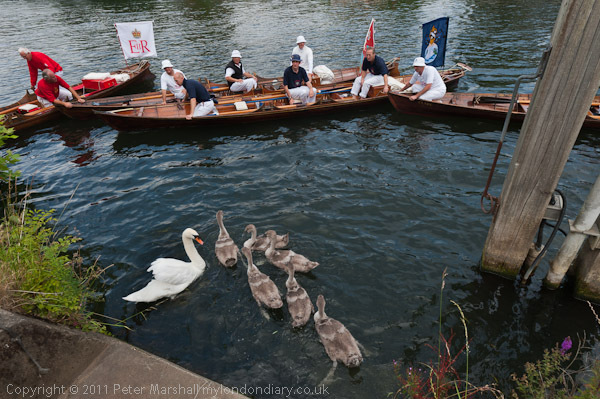 I wouldn’t normally go out to take pretty pictures of swans, but yesterday I spent the morning travelling up the River Thames alongside the swan uppers, something I’ve done most years since I left full-time 9-5 work to become a freelance a dozen or so years ago. Although I live just five minutes walk from a part of the river they go along, for 25 years or so I was always busy earning a living a few miles away when they came through. Sometimes the following week there would be a picture in the local paper of the boats in one of the local locks, but more often or not just a brief note or nothing at all. The first time I actually went to watch them at work was something of a revelation. I’d assumed it was simply a week of rowing up the river in fancy dress and making the most of the many riverside hostelries, but what I found was rather different, highly skilled men (as yet there are no women uppers) working together in an activity that now has some genuine environmental worth. It is a delight to watch them at work, their expertise in handling the boats to surround a pair of swans with their young, the brief struggle as they grab the birds out of the water, the careful way they handle and examine them before returning them to the river, where seconds later the family is swimming again as if nothing has happened and the men are getting back into the boats to continue their journey upriver. 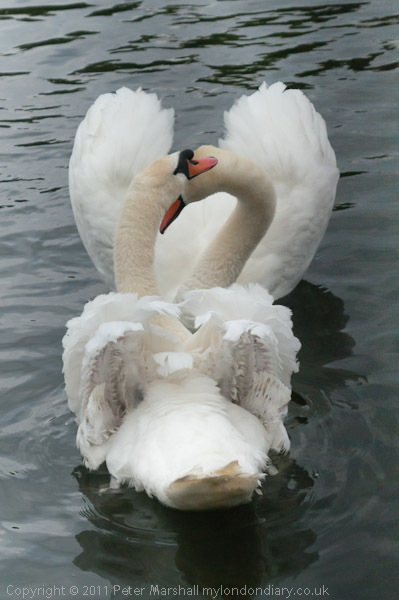 We hadn’t seen a great deal of action yesterday, and there does appear to have been a considerable decline in mating pairs on our stretch of the river in recent years, and this year in particular several of them had no cygnets. Somewhere swans must be doing rather better, as at Staines and particularly Windsor, where tourists flock to feed them there are large herds of unattached swans. I’d almost given up hope of taking more pictures of the uppers at work to add to my extensive collection when I saw the Swan Warden’s boat (a no-nonsense dinghy with an outboard) several hundred yards ahead had pulled over to stop near a couple of swans just a hundred yards or so short of the Swan Hotel where the uppers were to stop for lunch. It was on the other side of the river, but close to Staines Bridge, so I cycled madly (and a little badly) and managed to arrive on the towpath just in time. The male bird had swum away, possibly frightened by the arrival of the launch carrying the journalists which had for once got ahead of the rowers or the small crowd who had gathered to watch, but the uppers were able to surround the female and her six cygnets and with their usual skill bring them to land. You can see a few of my pictures on Demotix, and more in due course on My London Diary. But finally, after the cygnets had been ringed and the details recorded, the birds were carefully returned to the river, swimming out to meet their father. Last to be put in the water was the female swan, who immediately swam out to her mate, and I took a sequence of pictures of their reunion – of which the image above is one. Although the swans were happy, I was not, because the picture above isn’t quite as I took it, as I did a quick and not quite complete exposure gradient correction in Lightroom. Below is the next frame from that sequence, totally uncorrected and as you can see the exposure differs greatly at the right side of the frame, taken with a Sigma 28-300 on the D300. By the time I arrived home twenty minutes later, the fault was even worse, with half the frame completely blacked out. I’ve actually had this fault before, a month or so back, but on just a few frames, and the camera had then returned to normal working. I had another event to photograph later on in the day, but I left the D300 at home and worked just with the D700, suffering from not always having the lens I wanted on the camera, and missing opportunities when changing lenses. I really have got used to working with two camera bodies. This morning I picked up the D300 again and took a couple of test frames, and it was working perfectly. Looking at the EXIF exposure data there appears to be a link between this fault and fast shutter speeds. I hadn’t actually meant to take these pictures at 1/2000, but I had the camera on manual and this happened to be the setting when I saw this reunion take place, and the overall exposure was roughly correct. I hadn’t deliberately set such a fast speed, which I think was simply a case of idle fingers on the camera dial. I’ve now tested this, and can reproduce the effect. The camera works fine up to around 1/1250, and at 1/1600 I can see some slight darkening on one side. At 1/2500 slightly over half the frame is dark and faster than this most or all. So at least I have some idea of what is happening, and know how to avoid it. It also means that when I take it – as I will need to one day – for the inevitably expensive repair I’ll be able to say exactly what the fault is, which considerably improves the chances of getting it repaired. But perhaps Nikon will come out with something shortly (if they have recovered from the earthquake) which will mean that rather than repiar the D300 I will want to replace it. This entry was posted on Tuesday, July 19th, 2011 at 09:19 am and is filed under My Own Work, Photo Issues, Technical. You can follow any responses to this entry through the RSS 2.0 feed. You can leave a response, or trackback from your own site.